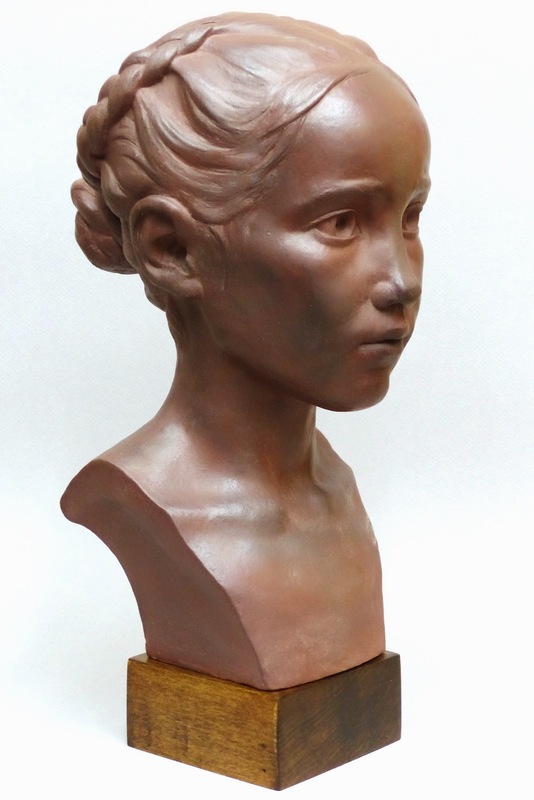 Earlier this week, The Society of Portrait Sculptors unveiled their 51st Annual Exhibition. 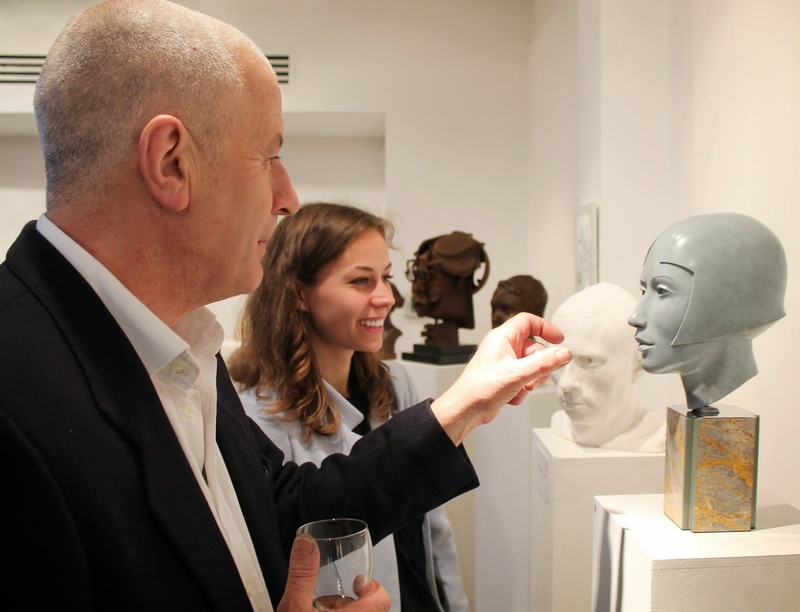 Fondly known as FACE 2014, the show features recent works by 55 contemporary sculptors. Some of these exhibitors are society members; others were selected from open submissions originating as far afield as America, Australia, China, continental Europe, Mongolia and Scandinavia. 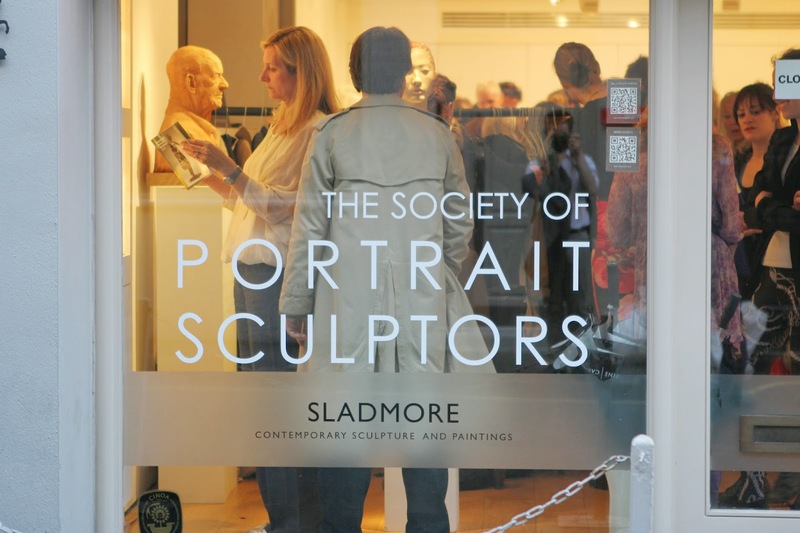 Held at the SladmoreContemporary, London’s leading contemporary sculpture gallery, speeches were delivered by society president Etienne Millner and Professor David Ekserdjian. 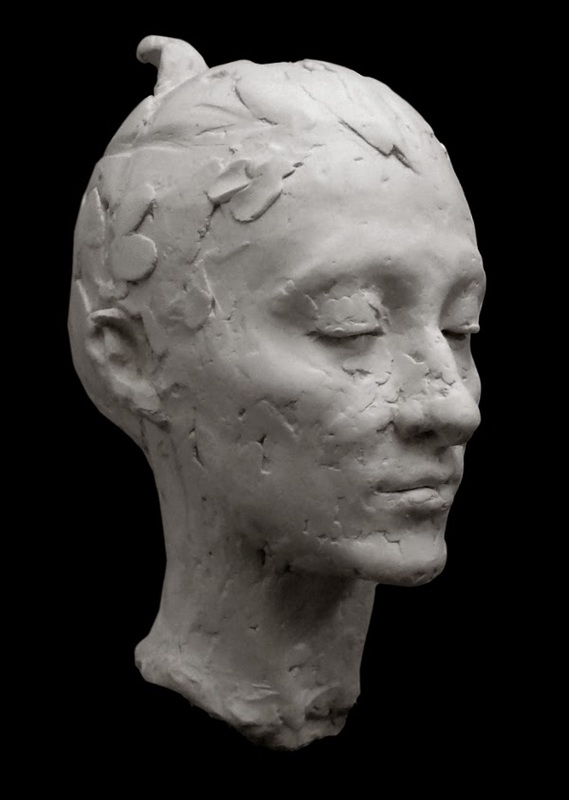 Millner was quick to pinpoint FACE 2014’s purpose as: ‘to make portrait sculpture more accessible and to highlight its strengths as a means of conveying likeness’. 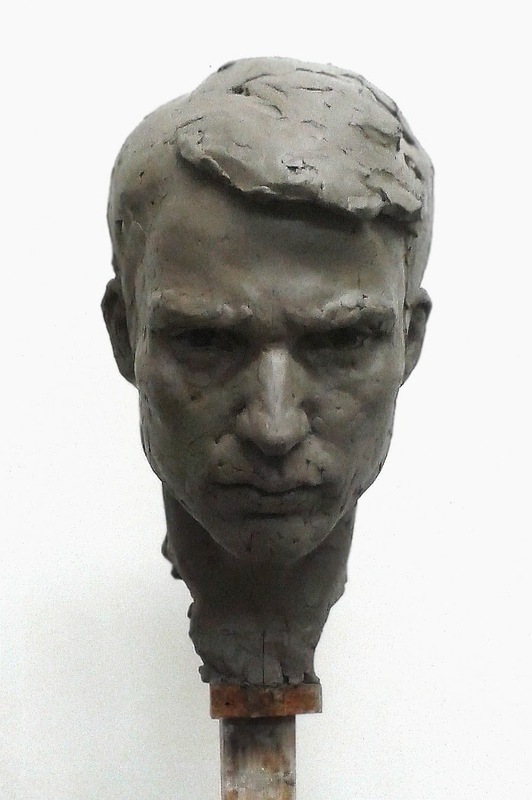 With six notable works by young sculptors it really does seem that there is an increasing interest in portraiture. This is an art form that Millner affirms ‘has emerged unscathed from the arid years of abstraction and conceptual art’. 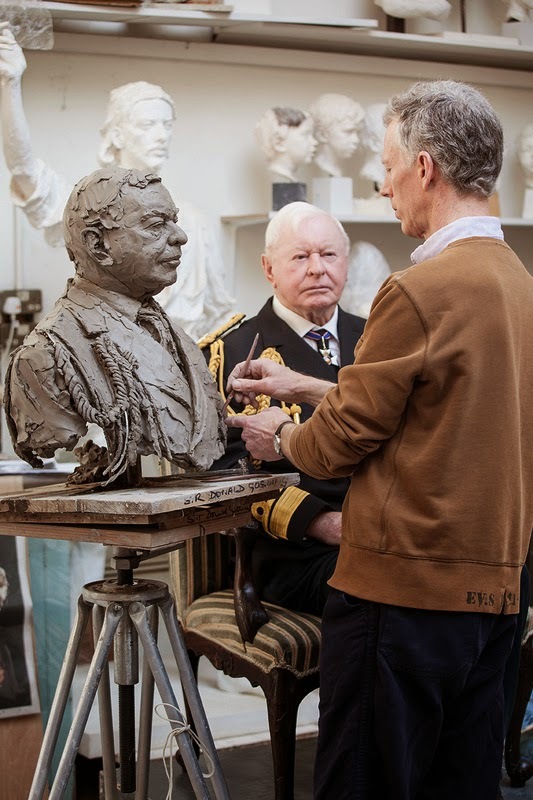 Etienne Millner sculpting Vice Admiral Sir Donald Gosling KCVO. Bronze. Photo by Angelo Plantamura and provided by the artist. 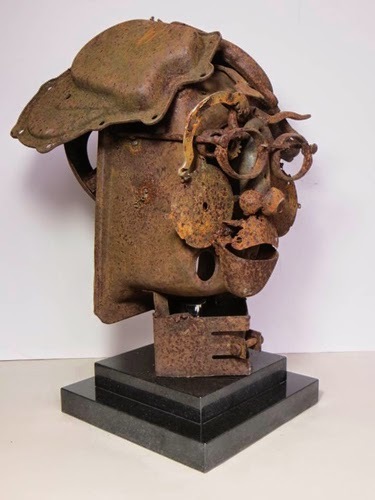 Millner is a sculptor of remarkable distinction. He championed figurativism even when it was ‘largely rejected in favour of abstraction’ and his works can be found in numerous public and private collections. These include: the National Portrait Gallery; Harris Manchester College, Oxford; Wellington College; Goodwood House; Weston Foundation; Longford Castle; Daily Mail; London Borough of Ealing and The Museum of The Negev, Israel. It is therefore unsurprising that patrons regularly consult Millner and his associates when commissioning sculptures. 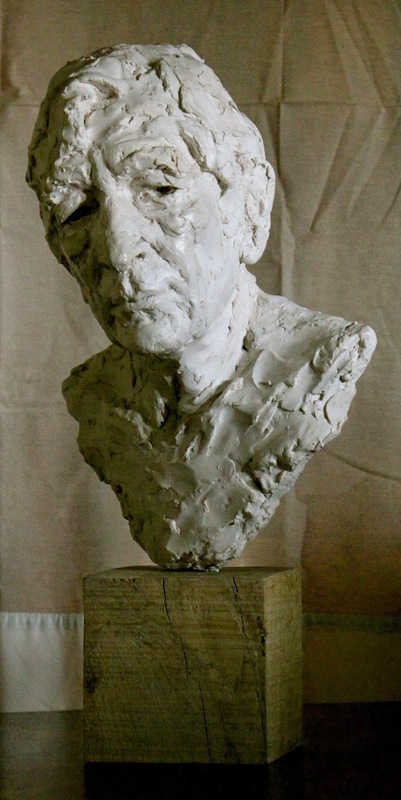 So, to exhibit at The Society of Portrait Sculptors’ Annual Exhibition, unique in theme and prestige, provides select sculptors with an opportunity to demonstrate their skill such that they might be put forward for large-scale monumental projects as well as private ones. Then there are the prizes. 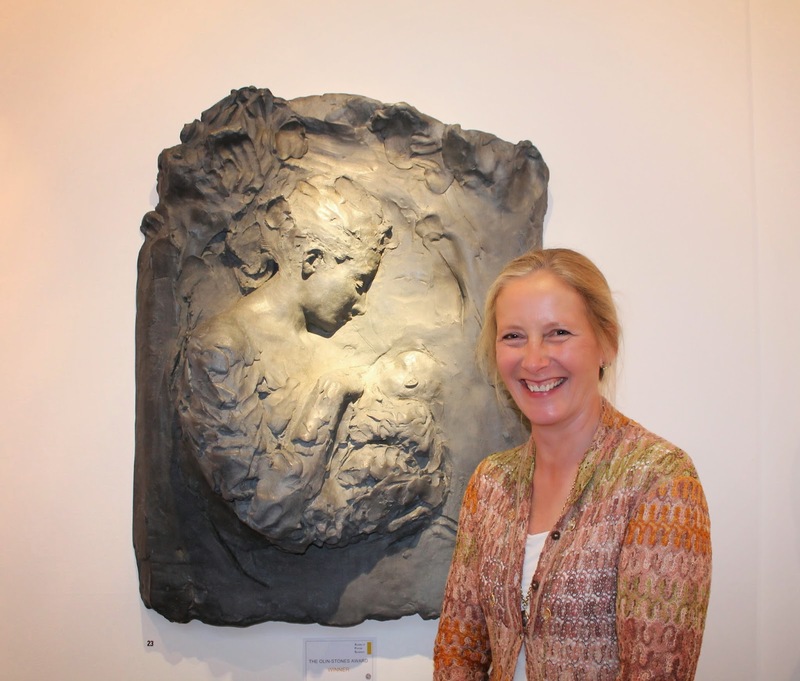 Louisa Forbes with her relief sculpture Mother and Child. Lead. Photo by James Larcombe. Louisa Forbes has two works included in the show. 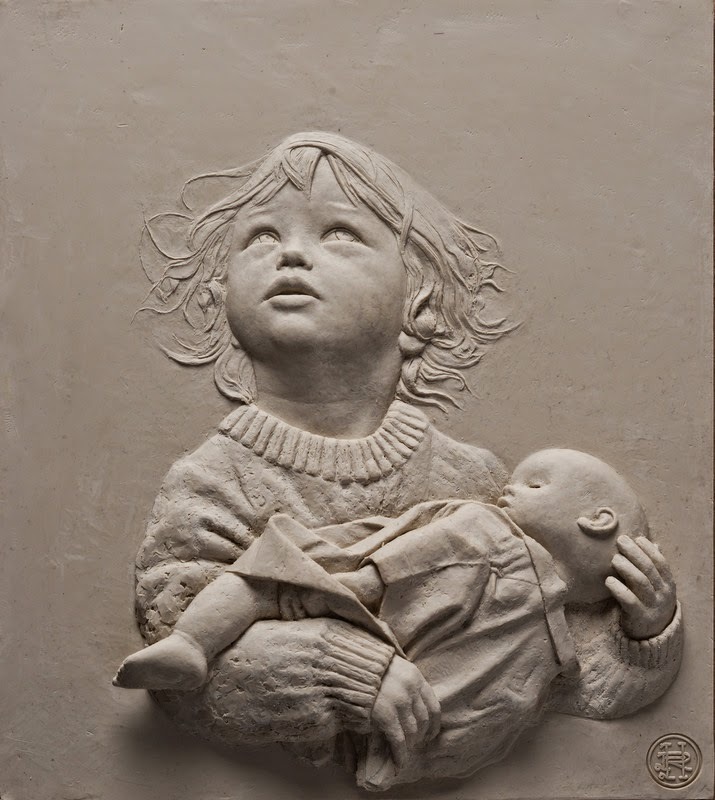 It was for her ‘self-explanatory’ Mother and Child that she was awarded the Olin Stones Prize for relief sculpture. Identifiable by her loose yet delicate modelling, Louisa is drawn to classical subjects and consciously references religion and mythology in her works. 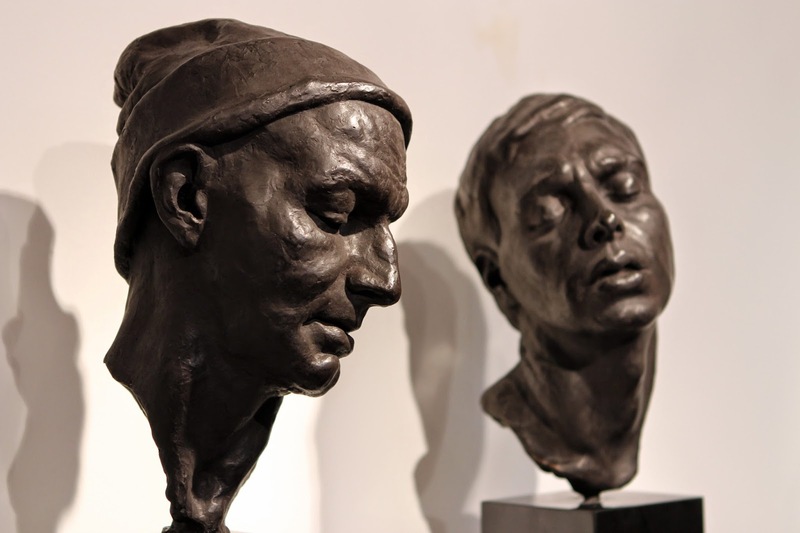 Her other sculpture, The Pythia, a smaller than life-size bronze head, was inspired by William Golding’s The Double Tongue. This year, for the second time, Domenica de Ferranti won the Tiranti Prize. Domenica’s career has gone from strength to strength since she first received the prize in 2009. 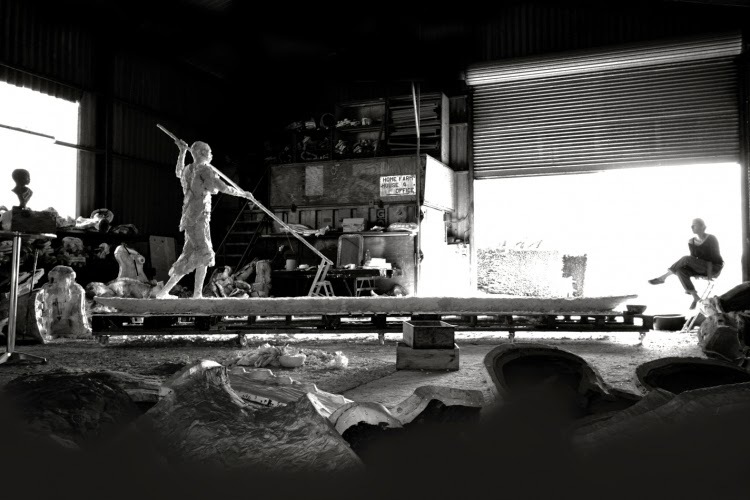 Working from her south London studio, Domenica’s current challenge is to figure out how she might best transport a life-size bronze commission to its patrons in South Africa! Canoe by Domenica de Ferranti. Plaster, to be cast in bronze. Photo provided by the artist. However, it was Domenica’s outstanding plaster portrait, Rob, which caused a stir on Monday. Her rhythmic handling of simplistic forms is truly remarkable. Interestingly, the project had an ominous start… Domenica’s sitter nearly left after she told him that what she ‘really liked was the “wonkiness” of his face’. Fortunately for us he stayed! Rob by Domenica de Ferranti. Plaster. Photo provided by the artist. Like Domenica, Giles Lester received a classical artistic training in Florence. Judged to be this year’s best newcomer, Giles was awarded the The Talos Award for Olwen. Sculpted with sensitivity far beyond his years, Giles describes this portrait as an ‘impression’ of his mother who remained ‘patient and generous with sittings’ over the busy Christmas period. 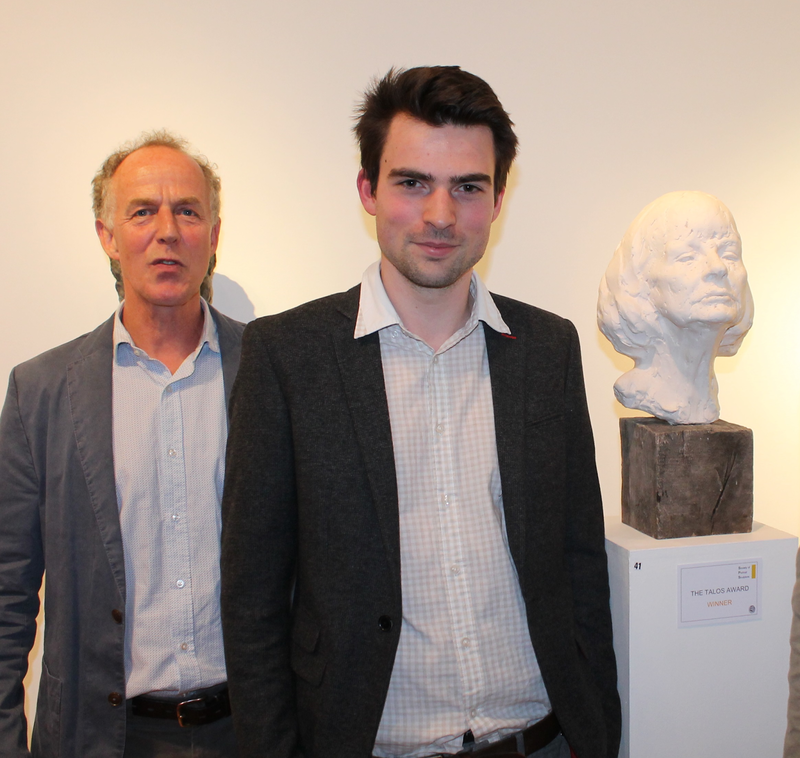 Richard Atkinson-Wiles, Giles Lester and his sculpture Olwen. Plaster study. Photo by James Larcombe. It was under the instruction of Robert Bodem, at The Florence Academy of Art (FAA), that Giles met his close friend and model for his second exhibited work, Valentina Zlatarova. Observant viewers at the exhibition will have noticed a quiet dialogue playing out between this sculpture and Valentina’s own portrait of Giles. Valentina by Giles Lester. Plaster study. Photo provided by the artist. Incidentally, Valentina’s works have also been recognised. She received the Tiranti Prize in 2008 and 2011 as well as the Founders’ Prize in 2009. This year, the haunting, brooding melancholy of her portrait Giles stopped many viewers in their tracks. Giles by Valentina Zlatarova. Plaster version on display. Photo provided by the artist. Ekesdjian was then in the process of curating Bronze at the Royal Academy and knew his friend was right. Ekesdjian exhibited it. As a great believer in discussing and debating projects with peers, Ekserdjian used this to communicate the advantage of not being overly ‘sensitive’ to sharing ideas. Perhaps taking heed, Ian Rank-Broadley told me a little about his awe-inspiring exhibit Napoleon. It is a study for what may become a life-size equestrian statue of Napoleon Bonaparte! In the pursuit of truth, Ian has spent substantial time at Chatsworth house studying Antonio Canova’s Bust of Napoleon Bonaparte. Napoleon by Ian Rank-Broadley. Bronze. Photo provided by the artist. However, it would be wrong to only recount the projects of FACE 2014’s exhibitors. I was fortunate enough to meet many interesting people, including Arthur Millner. Although an auctioneer by profession, Millner has been ‘experimenting with glazes’ in his studio in Shopshire. This reminded me of a recent conversation I had with the painter Nelson White. Nelson admitted that he tends to think well of art market professionals that also practice art! Such tangible self-expression is a universal language. Tristan MacDougall has also been exploring ceramics, having been inspired by sculptures with glazes that produce ‘stunning effects’. However, he is wary that too much polish can disguise form and so finishes his fired earthenware with a combination wax and a light polish ‘to pick out high points’. His success manifests in the brow and cheekbones of his exhibited portrait Sakura. Sakura by Tristan MacDougall. Fired earthenware. Photo provided by the artist. Sakura is based upon Tristan’s eight-year-old daughter. Although Tristan’s children are ‘competitive about being models’, neither enjoy the reality of sitting for a portrait. As such, Tristan found himself referring to photographs whilst committing Sakura’s face to memory whenever she was eating, sleeping, watching television and so on! 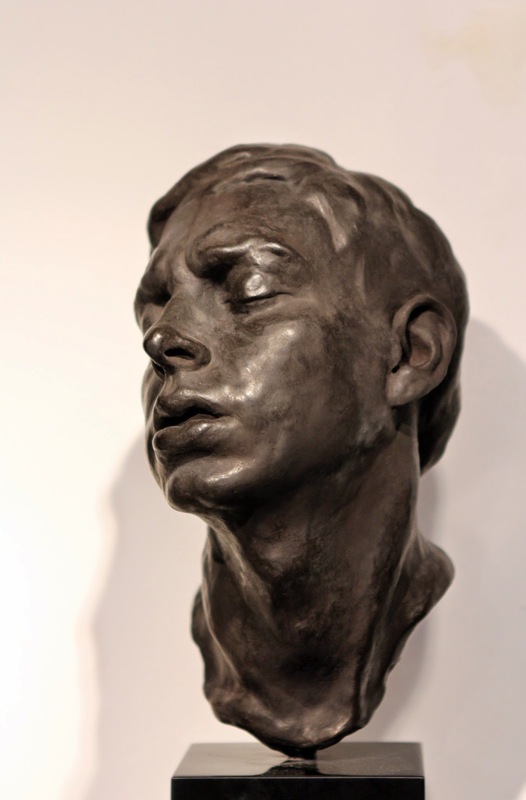 At the root of Tristan’s work is ‘a deep respect and love for the tradition of classical sculpture’. Driven by the desire to ‘push his craft to higher standards’ he is discovering the possibilities of working in relief. Icarus by Tristan MacDougall. Fired earthenware. Photo provided by the artist. Robert Hunt also has a ‘special interest’ in relief sculpture. On display were portraits of his great-nieces Hope and Alma. Working from his studio in Winchester with photographs, Hunt strives to ‘trick the eye’. Hope Bradby by Robert Hunt. 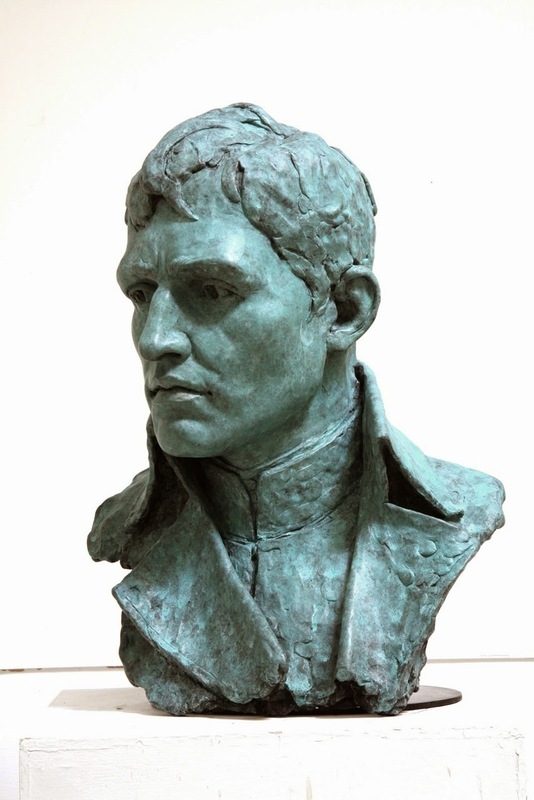 Exhibited in Bronze. Photo provided by the artist. FACE 2014 was a chance for me to see works by fellow FAA alumni. And, though I have striven not to be biased, I must tell you about my favourite work on display. Maddox, by Bayasgalan Batmagnai is a portrait of Derrick Maddox - a good friend and fellow sculptor. What really overwhelms me about Bayasa’s work is his ability to gracefully amplify an entirely revealing fleeting expression. In Maddox, Bayasa captures his sitter in a moment of contemplation – but incorporating Derrick’s signature beanie hat acts to humanise the work. Maddox and The Last Seeing by Bayasgalan Batmagnai. Bronze. Photo by the artist. When in contact with clay, Bayasa feels his hands become a living tool. For Baysa, the very act of sculpting can carry ‘an overwhelming feeling of elation and pure happiness ’ as well as the inevitable frustration when faced with ‘obstacles related to continuous learning’ and the need to understand his subject. The Last Seeing by Bayasgalan Batmagnai. Bronze. Photo by the artist. As an aspiring art historian, FACE 2014 reassured me that the future of portraiture is in safe hands. Together, the exhibitors are pushing boundaries yet maintaining traditional techniques. Self Portrait by Gilbert Whyman. Welded steel. Photo provided by The Society of Portrait Sculptors. 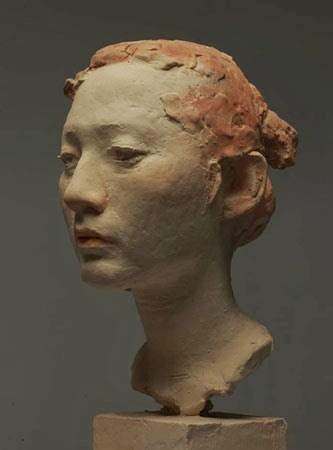 Northeast Girl by Professor Li Xiang-Qun. Resin. Photo provided by The Society of Portrait Sculptors.